The South African Law Reform Commission (SALRC) in conjunction with prize sponsors Juta Law, are proud to announce the relaunch of the long-standing annual legal essay writing competition for South African law students. Previously named in honour of Justice Ismail Mahomed, the first Chief Justice of the democratic era, the SALRC Legal Essay Writing Competition will in future commemorate a range of our legal luminaries who have dedicated their lives to the advancement of constitutional democracy. The 2018 season will honour the memory of the late Chief Justice Pius Nkonzo Langa who served with dignity and distinction. Justice Langa’s legacy of legal excellence continues to shine as a beacon for future generations of legal scholars, practitioners and jurists. 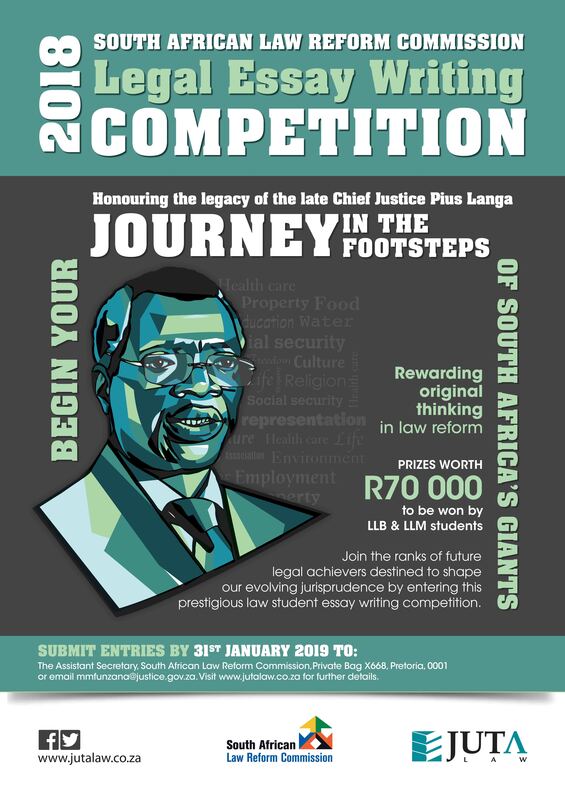 Drawing on the inspirational legacy of Justice Pius Langa, the SALRC invites all law students studying towards an LLB or LLM at a South African University to begin their own journey in the footsteps our South Africa’s legal giants by submitting their innovative ideas championing law reform issues by 31 January 2019. For more information on the competition and the prizes to be won, please visit www.juta.co.za. Students and academics can also follow the competition on Facebook @SALRCEssayCompetition and on Twitter @SALRC_Comp for useful competition updates, interviews and essay writing tips.